Industrial Strength is proud to present our first Bass and Effects sample collection created especially for Native Instrument's Kontakt sampler. This intense 24 Bit collection of samples was created by Italian Sound designer Impulse Factory with one goal in mind - to deliver the most usable and upfront sounds all taken from his Virus Infection Patch collection. Since not everybody owns a Virus TI, we thought audio versions of his Virus Infection sound bank was a must for any producer looking to have a that Impulse Factory Virus TI sound right in your Daw. If your looking for a fresh new set of great Virus TI drums, bass and sound effects for your music productions, then look no further. Each Virus patch was re sampled note by note, and key mapped to give you a top notch sound while having complete control of each sample while using Native Instrument's Kontakt sampler. This audio version contains 47 sampled Virus Drum, Bass and Effect patches over 4 banks for extra flexibility when assigning outputs, effects and midi channels to the instrument you select. We also included 69 NN-19 patches for Reason Users. The pack contains sound content that can suit many styles of electronic music. The sounds vary from dark bass sounds, distorted bass leads and wicked sound effects The bass sounds are cool for Drum n Bass, Dub Step, Hard Dance, Techno, and Hardstyle just to name a few. You can tweek each bass or effect sound head on. All the samples are pumped up and ready for effects and pretty much anything you can throw at them. You can even use the sampled sounds in this ISR pack in any other software sampler you wish to use, making this pack a go to Virus TI sound source. 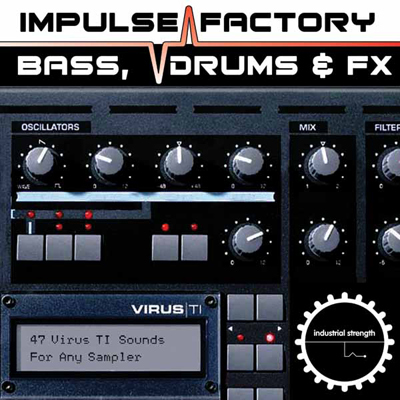 If your production calls for Virus TI Drums, Bass & Effect sounds, then the Impulse Factory's Virus Infection Audio Version is here to answer your call!